Hello everyone! 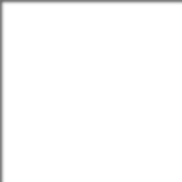 In this article I’m going to talk about a product from Byer of Maine. Approximately 4-6 weeks ago I was sent a Traveler XXL double hammock. Since then I have setup the hammock a few times. The Traveler XXL Double hammock comes packed in its own pocket. It includes approx. 8ft of rope for each end of the hammock. Each rope has a metal hook attached to one end. The other end of the ropes have a loop tied into it. The ropes run through a channel that is sewn into each end of the hammock. Note: I use a food scale to weigh gear. At first I admit I wasn’t sure on how to use the rope suspension that was included. Of course I had to google to find the various ways of attaching this suspension to the trees. The method I decided on was to take the end of the rope with the loop & wrap it around the tree a couple of times then take the other end of the rope with the hook & attached the hook to the loop. I did the same process at the other end of the hammock. 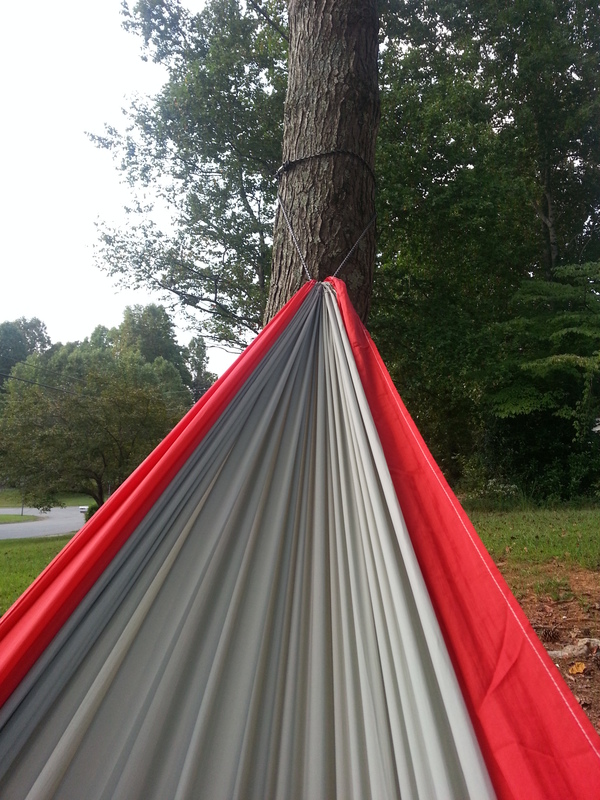 In my video below it shows a demo of how I setup this hammock. The first time I set up the hammock the trees were about 15/16 ft apart. It was an easy set up & the hammock hung very nice. The next time I went to set up — the suspension would not reach the trees I choose. These trees were about 20/21 ft apart. I have used these trees in the past with a hammock that has an adjustable & longer suspension. With trees further apart the suspension/rope usually needs to be placed just a little higher up on the tree. I moved over to a different set of trees that are about 14 ft apart and once again it worked really well. Did the rope suspension stretch? When I first sat in the hammock I did not noticed any stretch in the ropes. During the whole time I tried this hammock I never felt a stretch in the ropes. Even though I’m a lightweight I have had rope suspensions stretch on me in the past. I’m sure it’s fair to say after long term use — any ropes of this style will stretch. It is good practice to inspect any suspension after a few uses. 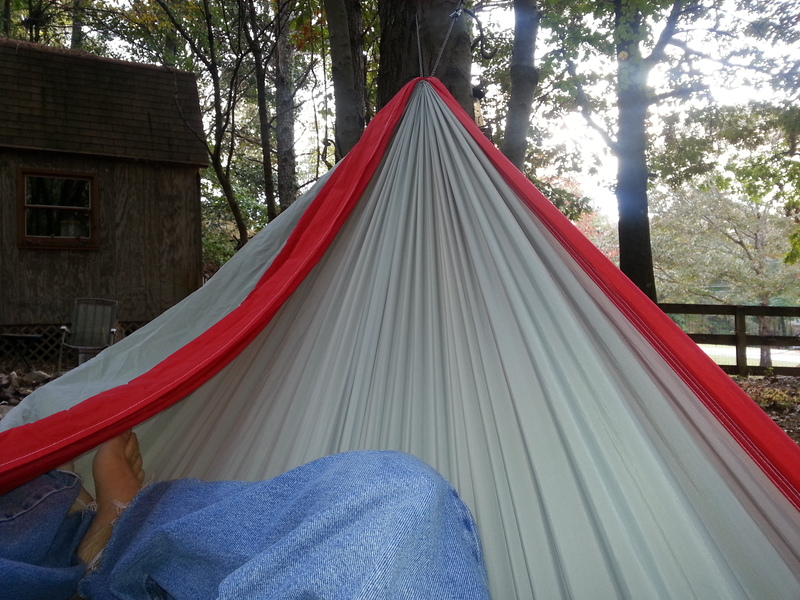 I found it easy to find a sweet spot almost as soon as I got in this hammock. At 7.5ft wide this makes it easier for one person to lay diagonal & get comfortable. It’s also very easy for two people to sit in this hammock chair style to lounge around. This hammock has a very simple design with not much fiddle factor. 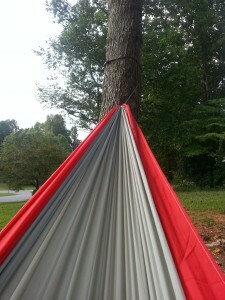 Out of the box you have a full size hammock that can be setup quickly. At 10.5ft long – A sleeping pad or underquilt will work well with this hammock to add insulation along with your sleeping bag/ top quilt. Plus, most hammock tarps on the market will fit well over this hammock to add shelter from the weather. The quality of the material & stitching is very nice. I found the material soft & comfortable. For me the rope suspension has limitations so changing the rope suspension on this hammock is a simple chore. With the nicely sewn strong end channels this will allow you to incorporate almost any variety of hammock suspensions on the market. 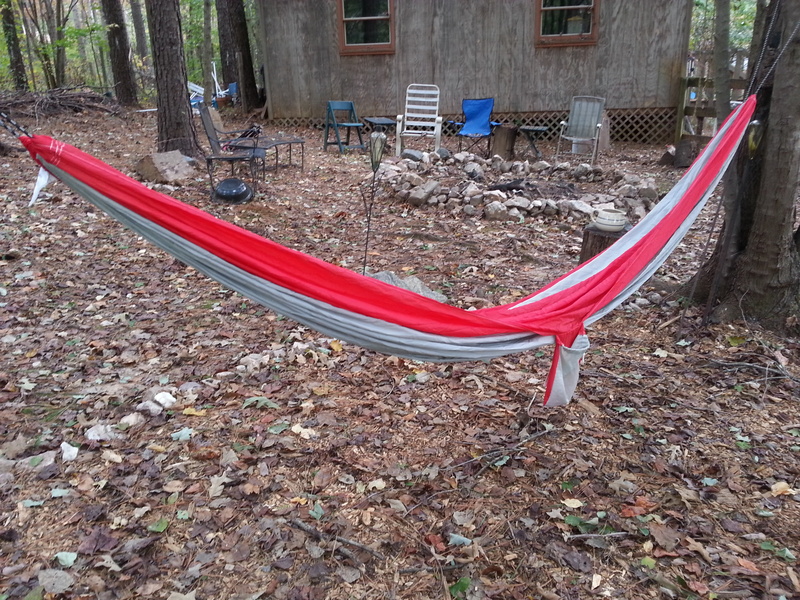 If you’re looking for a bigger hammock for camping or even day trips to beach/ lake or just to lounge in the yard this hammock is great for a good nights sleep or those long naps. Thank you for reading / watching. Please remember LNT. Any questions please leave a comment below – I will try my best to answer.